The FOM University of Economics & Management offers academic training opportunities in 31 locations. 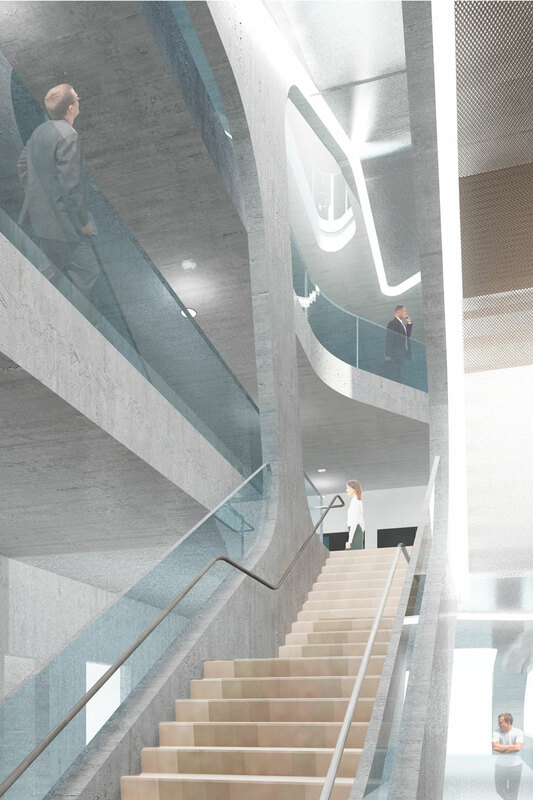 Under the helm of the FOM University of Applied Sciences, the BCW (BildungsCentrum der Wirtschaft) is planning a new university building in Berlin's Charlottenburg-Wilmersdorf district near the Tiergarten – in accordance with the design plans of the architecture firm J. MAYER H. and Partners. The building's five floors house a foyer with cafeteria, lecture halls, seminar rooms, administrative offices, library / reading room and group room. Underground parking is located in the basement, in addition to technical areas. The monolithic building envelope, interrupted by generously glazed windows, is the main characteristic of the building as well as the formative and identity-creating architecture. The windows are conceived as a 2-shell construction of box windows. They are of course ventilated by means of permanent openings and sealed off floor by floor. The box windows take on the motor-driven sunscreen. The inner primary façade can be opened manually. 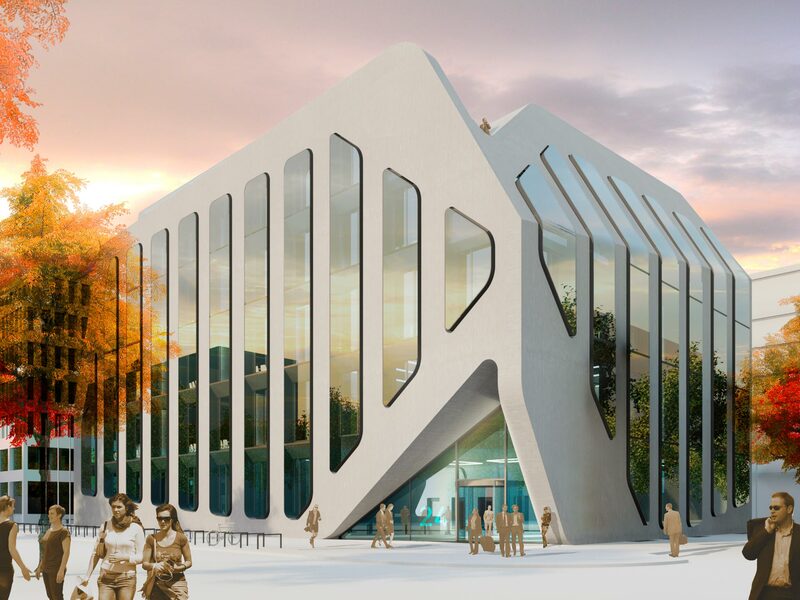 Using lightweight concrete, there is no core insulation in the opaque façade components. The objective is the development of a high-quality building with innovative, structural measures, minimized and efficient building technology with good user comfort and low energy requirements. On all levels, a cavity floor with regularly arranged maintenance openings provides the necessary flexibility with regard to changes in usage units, room layouts and media distribution. 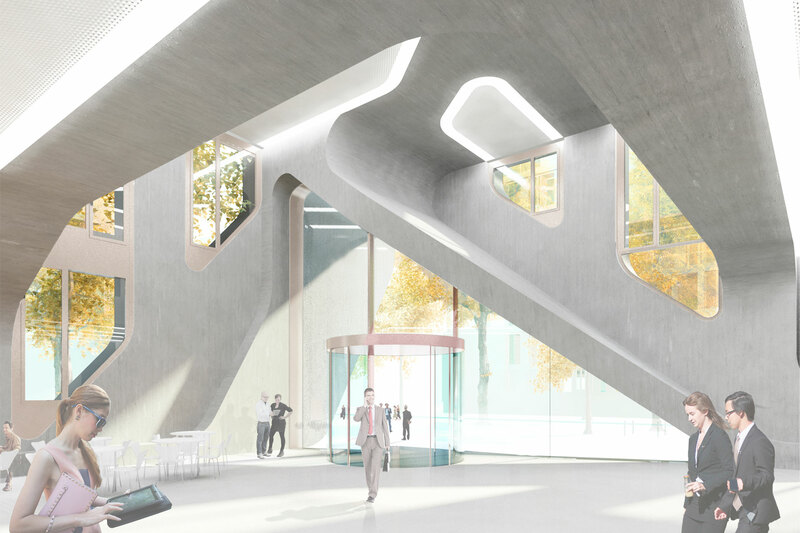 The comfort concept uses the thermally activated component mass in the foyer floor or in the exposed, massive ceiling areas of the main usable areas. Thermally highly loaded seminar rooms and lecture halls also have acoustically effective cooling ceiling panels. Additional heat loads are dissipated convectively via ground-integrated fan coils. The entire building is mechanically ventilated; the air change rates are adjusted according to CO₂ requirements. The heat supply is provided by the district heating network of Berlin. Wherever possible, the cooling requirements of the building are met by free, adiabatic cooling by means of re-cooling systems on the roof and by ventilation-integrated exhaust air humidification.